That’s because we have so many notifications, alerts, to-dos, things screaming for attention. Oftentimes, when we are not aware, we could simply spend an entire day just doing things, rushing from place to place, clearing item after item. But these may not be the most impactful things that move us towards our goals. So how can we focus on the impactful and make the most of our days? Hey everyone. That is Celes from PersonalExcellence.co. Welcome back to the podcast! Today I want to talk about productivity — specifically how to be productive, not busy. I feel that in today’s world, it is so easy to be busy rather than to be productive. That’s because we have so many notifications, alerts, to-dos, things screaming for attention. Oftentimes, when we are not aware, when we are not conscious of it, we could simply spend an entire day just doing things, rushing from place to place, clearing item after item. But these things may not be the most impactful things that help us move towards our goals. So today I want to share some simple tips, six tips in fact, on what we can do to focus on being productive rather than being busy. My first tip is don’t start your day with chat. It is very instinctual to want to open your chat application in the morning and see who messaged you. Thinking, What do I have in my chat inbox? What messages do I have? It feels exciting because you are getting messages from people, people you care about, or new people you just met. Also, it is sometimes like a little gift, like each message is a little gift and someone has a special message for you and you want to see what’s that. So I totally understand that. But unless it is an off day where you are not working, for your work days, I recommend not starting your day with chat because it can easily derail your day into a series of chat exchanges where chat is your main focus, as opposed to what you need to get done. This is especially true if you are an entrepreneur, you control your day, you control your routine, or if you are a freelancer. It is very easy to have your entire day derailed because of chat or even because you are looking at your social media news feed. You know, the social media platforms today. I shared in a previous episode on FOMO, the fear of missing out, about how social media applications and platforms today are designed to get you to come back to the platform. When you start your day with chat and this may be a chat application or a chat tool built into a social media platform, you have already entered their arena where there are all these design elements designed to get you to come back to the website. From the notification button color to the placement to the user interface, and so on. The best way is simply not going into chat at the beginning of the day. But instead focusing on the things you need to do. Another reason is that at the beginning of the day, our energy is at its highest and you want to direct that to the highest purpose activities on your to-do list. As opposed to pumping that into chat because then you’ll be putting your best energy into chat messages and replies which may not be the best use of your energy. There is an exception to this rule, which is if the person is a family member, an important loved one, like your partner or your kid. With these people, you should have a channel where they can easily access you. So this could be chat, this could be some other channel. That’s because there could be some urgent family matter or important issue where they need to notify you. Having this instant access lets you know if there anything that you need to tend to and so on. This is where there is a conundrum. Because then you’ll be wondering, Oh okay, if I need to be easily accessible to these people, the problem is when I check messages from them, I will naturally see messages from others. My answer is to use two different chat applications. This is if you find that it’s worth doing that. Using two different applications: (1) One for your super important, inner circle loved ones. The people who need 24/7 instant access to you; and (2) The second for everyone else. The good thing is there are so many applications today. Line. WeChat. Whatsapp. Facebook. Telegram. And so on. Simply designate one app to everyone else, I guess the default channel that everyone uses like WhatsApp and Facebook. And use a different channel that very few people use. Use that channel and allocate that to just your loved ones, like your parents or siblings or your spouse, your children. This way you have a separate channel that’s just for these people and you can use that without all these non-stop notifications, all these elements trying to pull you in. At the same time, you can still connect with the other people in your circle using the general application for everyone. I do that and I find that super useful in helping me stay focused. Before that, I was just using one application for everyone when the one person I communicate with the most and I need to communicate with frequently would be my husband. I found that a lot of times when I was checking the chat application for his messages, I would naturally see the messages from other people. Some of these messages, in fact, most of the conversations were not essential. It’s like banter, casual banter, which is fine and good for socializing, but not to the extent where I need to see it all the time every day. The problem is when you log back onto these chat applications, you know that many of the social media tools today will show what time you were online and many of these tools don’t have a feature for you to turn it off — which is terrible. Then other people will see, “Oh you’re online, but you’re not replying to me. Why are you not replying to me?” And then that’s all this nonsensical stuff which is totally unnecessary. So I find the best way is to simply use a different app for these inner circle people whom we need to communicate with on a very, very frequent basis throughout the day. And also with them, they understand that each of us has things to do. I have my things to do. You have your things to do. And our priority is to focus on these things. But at the same time, we check back this application throughout the day, just in case there are urgent matters, home matters, household issues, etc. that we need to see and deal with. Another way that one of my ex-professors uses is having two different phone numbers. One number for close family members. Another for everyone else. That can work too if you are okay with using two different numbers or you have a dual SIM card phone. Otherwise, using the two chat applications, that works pretty well. My second tip is to remove distractions. By that I mean the notifications, the alerts, all these different things that are so common and part and parcel of every application, software, website that we use or visit nowadays. I find them very intrusive. I always turn off all these notifications and alerts. Whenever I install something new, if I have to install — So firstly, I rarely install new apps or software, only the essential ones. That’s very important, knowing the key things you need to have and saying no to everything else. Then, with the apps that I do install, I will disable all the alerts, notifications, and so on. On your phone, there is an overriding feature in Android — I’m not sure in iPhone — where you can disable notifications. This is a phone-level setting, not a setting with the individual app. In the “Settings,” I think it’s there on most Android phones, there’s a feature in “Applications” where you can turn off notifications for each individual app. Doing so overrides the notifications for that app, if it doesn’t give you that option to turn off its notifications (which I find quite common in today’s applications). So turning off these alerts. Email alerts as well. I don’t have email alerts. I only check emails at specific moments of the day when I’m taking a break from my core task. Because when I’m doing a task, especially a high-level task, just having this stream of incoming notifications, be in terms of SMSes or email alerts or any app notifications, I find them very disruptive and they often take my mind from a high-level mode to a very low-level reactive mode. When there are all these notifications going on, even if no active notifications right now, I don’t enter into high-level mode because I’m constantly sitting in wait for the next alert, the next message, the next notification. So I’m sitting there, in reactive mode, anticipating, Okay there could be a next alert, so I don’t want to enter into this high-level thinking mode where I’m thinking about ideas or writing an article and so on. Some of you may be in positions where you need to be accessible all the time. For example, maybe you are an account manager at a PR agency and you need to be accessible to your clients. That is totally understandable. For these situations, I recommend designating fixed moments throughout the day where you check your messages, emails, return calls, and so on. This could be once every hour, at the start of the hour or once every 40 minutes. It could also be after you finish a task or a segment of a task. This way you introduce some structure into your days, as opposed to being in reactive mode 100 percent of the time. You want to be clear on the Quadrant 2 priority tasks that you want to get done, while being responsive to the incoming alerts, the firefighting staff you have to handle as part of your job. In our job, it’s common to have a lot of Quadrant 1 tasks, which are the firefighting stuff, the urgent and important tasks. And there are the Quadrant 2 — the very important but never urgent tasks. We want to strike a balance between getting the Quadrant 1 tasks handled, and also having the time to work on the Quadrant 2 tasks that never become urgent but it is important to work on them to make significant headway towards our goals. My third tip is to have a priority to-do list. Get clear on the 2-3 key things you would like to accomplish for the day for it to be rewarding. As part of this priority to-do list, you can have other things that you need to get done too. For example, scheduling this doctor’s appointment or returning this critical email and so on. These are little tasks that may not be in the top 2-3 things you need to get done, but you need to get them done as part of moving things forward. But in this to-do list, you want to be clear of what are the 2-3 key things, the big rock items, that you want to spend a substantial or considerable amount of your time working on and make good progress in them. When we don’t have a priority to-do list, it is really easy to spend our entire day working on 10 to 20 little things. But these 10 to 20 little things often don’t make a significant change or a significant dent in our Quadrant 2 goals in the long run. So we could be spending our entire day doing all these little things every day and constantly busy, thinking, I’m rushing and doing this and that, I’m multitasking, I’m doing all these different things. But that is not a good use of our time. If anything, when we are doing all these things, we are running in our rat wheels, as opposed to taking a good look at the tasks that require our time and energy, the tasks that we should be working on. When trying to transit from this working on 10-to-20-different-things mode, to the work-on-2-to-3-big-items mode, we can often feel a lot of resistance. Because there’ll be all these things trying to pull us away from our priority tasks. All these things screaming for attention, firefighting stuff, seemingly super urgent critical stuff. I would recommend not seeing it as an absolute change that you need to make. Like, Oh, okay, I must just do these 2-3 big things and that’s all. I don’t want to do anything else. Oftentimes it is a transition that we do where, okay, we spend some time on the 2-3 big things. We know what they are. We spend some time on them. But there would still be the little things that come in. Do what you can do. Do your best to hand those little things. Once you’re done, go back and focus on those 2-3 big items. See this priority to-do list as something to anchor you, to remind you of your priority to-dos. But don’t get pressurized or stressed by those things. For example, if you don’t make significant progress on these things, or you don’t even get to spend any time on these things today, don’t beat yourself up, okay? Don’t feel bad about it. Because it’s really normal. It is super normal especially when you are at the intersection of a million to-dos and a million things demanding attention, to sometimes have days where you’re working on these million things as well. That’s fine. Just do what you can to get these things sorted out and then direct your focus back to your 2-3 priority to-dos. That is the most important thing. Constantly making the effort to shift back to your priority to-dos, as opposed to taking it as an absolute standard that you have to follow. Because that can lead to a self-defeating mindset, a self-defeating situation where you feel bad, and you beat yourself up, and that isn’t what we’re going for here. My fourth tip is to batch similar tasks. Often times you will probably find a recurring pattern in the tasks that you do. And when you start seeing a similarity in certain tasks, it helps to batch them. Batch them meaning, let’s say you need to return email number 1 and then, later on, you need to return email number 2, and number three, and number four, and so on. So as opposed to logging into your inbox every 5 minutes to return one email, I recommend batching all these tasks together. So you can spend 1-2 hours on a Quadrant 2 task, and then at a specific point in the day, log into your email and reply to all these emails together. Another example is, say, you are a website designer. You are maintaining four different client websites. Say there are several changes that you need to make to website number three. And there are constantly new changes streaming in each day. Maybe it makes sense to batch all these little changes you need to make, and then make them at the end of the day or at a fixed moment of each day. As opposed to making no changes on an ongoing basis throughout the day. Because there is always a set-up cost involved for each task. Where you need to log into a certain interface, you need to key in certain details, you need to set your mind in that mode, and then you need to assess that situation and think about what you need to get done. This setup cost happens each time you work on a task. When you have many little tasks for an overall project, and you keep repeating the same steps even if each time you are doing one small little task… Say you have five little tasks for this big project. This setup time quickly accumulates. Before you know it, you would have spent the entire day on this setup time and this “switching cost” where you’re constantly switching from task one to task two. Even if you are a superb multitasker, which I’m sure many of you guys are, there’s always this cost involved. Again like what I share in Tip #2 on removing distractions, you’re forever spending your time in this reactive mode, this low-level mode, where you are doing all these administrative switching things, as opposed to getting into the high-level mode where you are making significant changes. So as much as possible, batching similar tasks together. This does require you to take a step back to evaluate and assess what are the tasks that keep taking up your time each day. Often times we are not aware that this is happening until we take a step back to write down the tasks that have been taking our time throughout the day, and start to see a similarity or trends in these tasks. 20% high-impact tasks. I recommend having a column where you write down your 20 percent high-impact tasks, i.e. the tasks that will make the biggest impact, that will be the best use of your time for the day. This would correspond to the priority to-do list in Tip #3. 80% low-impact tasks. Then have another column which consists of your 80 percent low-impact tasks, and these will be the tasks that need to get done, the little tasks that are not the best use of your time but need to get done. Will-do tasks. And then another column which would be the “Will do” to-do list where you write down the tasks that stream in throughout the day and you need to get them done. But you don’t need to do them right away. Oftentimes a lot of the things that we think what we need to do right away, we don’t really need to do them right away. Putting them in the “Will do” column and then assessing them at the end of the day and tending to them, helps us see the similarity in these tasks and batch them so that we can deal with them more effectively. My fifth tip would be to delegate. Now I know that this tip wouldn’t be applicable to those of you who are not in a position to delegate. But for those of you who are, maybe you are an entrepreneur, or you are at a managerial position, or you’re working in a team where the other co-workers handling different tasks, then it is important to learn to delegate. Even if you are not in the position to delegate right now, there will likely be a time in the future when you move to a different position in your career or you move up the value chain in your career ladder, where you would need to learn to delegate. I have to say that delegating has always been my Achilles heel because firstly, I like to be hands-on. I like to be in the thick of the things that I’m working on. I will say that I’m a creator. I get the satisfaction of creating stuff and you guys can see that. Like with my entire website, Personal Excellence, I’m very hands-on. The entire website is built by me and so on. When I delegate, I stop working on that particular stuff that I’m delegating. That removes one small piece of satisfaction because the creation process is where I get a lot of satisfaction. The second reason is that I don’t like to trouble people. I don’t like to implicate others or burden people with my problems. I just like to handle things myself and internalize and deal with them as much as possible. So for a long time, I just didn’t like to delegate. I would just do everything myself as much as I can to the point where I would feel like bursting. But I have found that delegating is an important skill. It is a crucial skill if you want to do much more than you are able to with your own bare hands. Because we can never accomplish as much if we are always relying on ourselves. We can always do more when we have an extra set of hands helping us. We can always do more when we have two different brains working on a problem. This is something that I took very long to learn. Nowadays I’m learning to do that more. Delegating, identifying which are the parts of my business where I should delegate and let someone else handle and help me in them, while I work on the higher-level stuff that is the best use of my time. With regards to delegating in my business, I have three factors that I use to evaluate whether I should consider outsourcing or hiring. Repetitive. Is this task repetitive? Is it highly recurring? If it is highly recurring, it has a high frequency, that means I should potentially look at hiring someone to handle this. Value of the task vs. my time. Is it the best use of my time? Or can my time be better spent elsewhere? When you are running a business and as your business matures and as your customer base grows, you start to be involved in many, many different tasks of many different functions. So you could start your business and many things are important. But there will be a point where there are just so many tasks and many things are important, but it’s just not possible for you to handle everything. And that will be certain tasks that are more important than others and that are a better use of your time. For example, in my business, there could be marketing, editing, audio editing, video editing, site maintenance, content creation. And all these things individually by themselves are important. But is every task the best use of my time? Or can my time be better spent elsewhere? And it is a very critical question because unless we consciously evaluate the value of our time and whether this time can be better spent on Task A or B or C, we will forever be in this mode where we feel that everything is important and everything deserves our time. But when we stack up all these tasks side by side, it becomes clear that there are certain tasks are a better use of our time than other tasks. And these tasks that the best use of our time, oftentimes they are the critical aspects of our business and our work. And us putting energy into them can create the biggest rewards. Pros vs. Costs of hiring. The last factor, whether the pros of hiring outweigh the costs. Because there will always be a cost involved when you’re looking at hiring or outsourcing. Now if you’re delegating to someone in your team, in the company that you’re working in, then the cost element wouldn’t really be applicable. But if you are a business owner or entrepreneur, then the cost element would be involved. Even if say if you are delegating something in your personal life — so you could be working in a company but you are looking at delegating aspects of your personal life, say household cleaning, grocery shopping, or potentially getting a helper, then the pros need to be weighed against the costs and whether it’s worthwhile. When you’re dealing with something that is highly repetitive, is not the best use of your time, and the pros of hiring outweigh the costs, then you should look at kickstarting the hiring process. It can be pretty difficult to get good talent, good people to help you or good services to help you. In some cases, it may not be hiring someone as much as you are engaging a service to help you in that thing. But once you find someone who can help you or a service that can help you, you will find the rewards tremendous. Because now you can take a load off your shoulders and dedicate your mind space, your time, your energy on the things that truly would be the best use of your time. Am I satisfied with how I’ve spent this week? Have I spent this week on the most important things on my task list? Could I have spent this week in a better way? Moving forward what changes would I like to make, if any? Asking yourself these questions can be very helpful because oftentimes we are just heads down in our work, our tasks, trying to complete item after item. We often don’t take this step back to get a macro focus on what we are doing, how we are doing things, whether that’s a better way for us to do something. Without this audit, we can forever be stuck in this micro mode, just rushing from place to place, finishing task off the task. Before we know it is already been weeks and weeks or even months, and we look back and we wonder, Where has all this time gone? WHY. Why are we doing this? Is this the best use of all time? WHAT. The things that we are doing. Are these truly the best use of our energy? Are these the things that will be moving us towards our highest goals? HOW. The way that we are doing things, the approach that we’re using right now, is this the best approach? Can there be a better approach? Can there be a better way to do things? So you can do an audit every week, every two weeks, or even every month. But the point here is to do an audit. Use the audit as a chance to evaluate how you have been spending your time, because it is so easy to be stuck in work mode, busy mode, and spend all the time that way without really thinking about whether this time has been spent effectively. An audit is this chance, this opportunity where we can take that step back to really think about how our days have gone, how weeks have been spent, and whether we can do things in a different way. Productivity is when we are consciously spending our time. Consciously approaching our days and thinking about how we can make the most out of it. Busy, in a way, can be considered a lazy way of living. In that, you’re not really thinking about the things that you’re doing as much as you are just doing them. While it is very important to have a good work ethic, which is what being busy is about, you want to make sure that your time is being spent in the most impactful way. This is what productivity is about: Working hard, while at the same time making sure that your hard work is creating the highest impact. Making sure that your energy and your efforts are creating the biggest impact in the world. So that’s it for today’s episode. Thank you so much for listening. 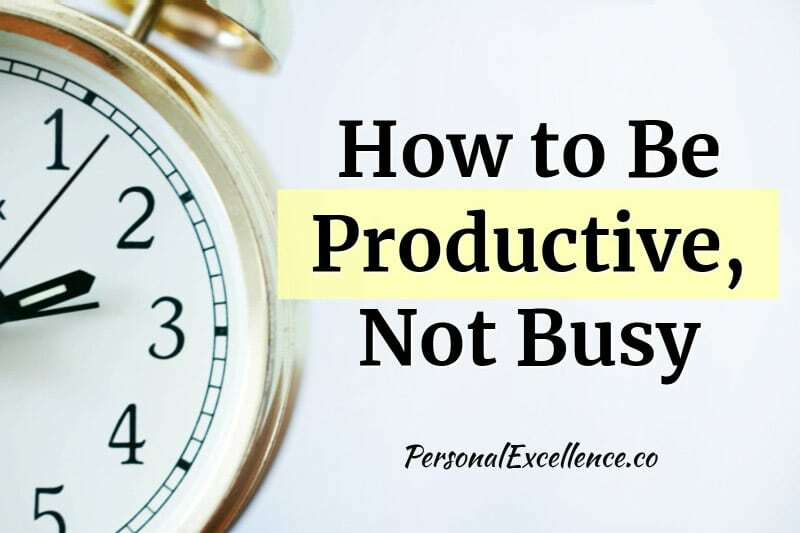 I have an article that shares more tips on how to be productive versus busy that you can check out in the show notes. I’m going to link that in the show notes, along with links to some other resources related to today’s podcast. If you have found today’s podcast helpful, I would super appreciate it if you can leave a review on iTunes. You can do that at personalexcellence.co/itunes. Every review goes a long way to helping the podcast to grow and towards spreading the message of conscious living further. I want to take this chance to thank all of you guys who have posted such positive reviews and sending such wonderful feedback to me through the contact form. I read everything single one of your messages and I’m so grateful for your support. So thank you so much to you guys. You guys know who you are.